Accenture’s Partnership with IBM helps our clients digitally transform their systems and rotate to the New with innovative solutions on IBM technologies. Accenture is a Platinum Level business partner with IBM and within Accenture’s Ecosystem, IBM is at the top of the list for Accenture growth partners. This is a testament to our 20+ year partnership. Accenture views IBM technology as a powerful platform for digital transformation, and Watson is a leader in Artificial Intelligence. Accenture receives privileged insight into IBM product engineering, R&D, and future roadmaps–ensuring we have the insight to guide our clients toward a sustainable solution using the right technology and expert delivery. Design and deliver innovative solutions for our clients. Invest in accelerators and unique capabilities built on IBM technology. Advance the skills of thousands of our technology specialists every year through IBM development programs. Build estimators and project delivery tools to deliver with better predictability. Use natural language processing and machine learning to reveal insights from unstructured data. Migrate our clients from on-premise applications to the Cloud, including Mainframe modernization. 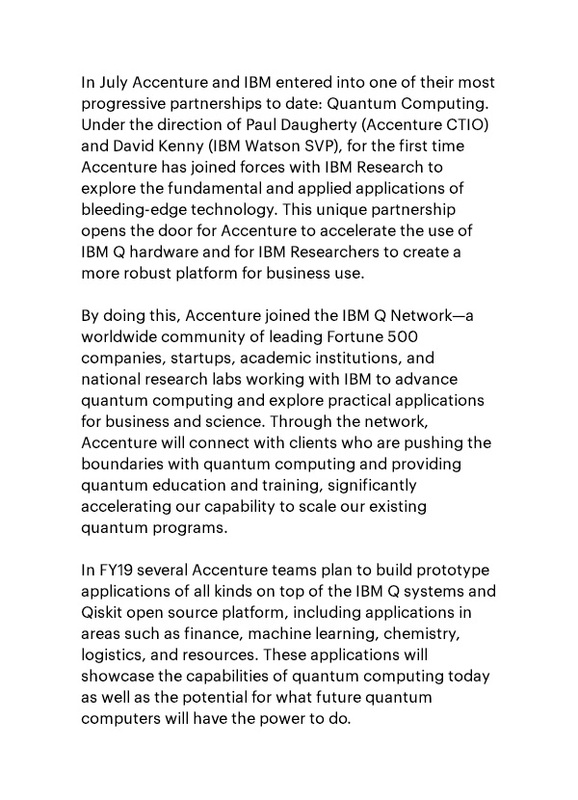 This progressive partnership between Accenture and IBM explores the fundamental and applied applications of this bleeding-edge technology. Together with clients, create rapid prototypes using Bluemix with agile and user-centered methodologies. The Accenture Interactive IBM Digital Practice transforms customer journeys. An innovative hub for rapid prototyping, Accenture IBM Studios build innovative solutions with speed and agility to help our clients transform their ideas into working prototypes within a few weeks. Helping businesses improve performance and drive revenue growth: Accenture’s Cloud Studio teams use IBM technologies to seamlessly integrate all IT components, such as analytics, mobile, and ERP, so our clients can become a connected digital enterprise. Helping our clients connect with their customers through interactive experiences that bond their relationship, while reducing the cost to serve:Accenture’s Watson Studio teams use natural language processing and machine learning to reveal insights from unstructured data. The Accenture Innovation Center for IBM Technologies differentiates Accenture in the market. This global team of dedicated practitioners has broad knowledge and deep skills on IBM software and hardware. Accenture helps clients identify and enter new markets, increase revenues in existing markets, improve operational performance, and deliver their products and services more effectively and efficiently. Read the Accenture Cloud Computing Blog for new ideas, the latest news and discussion around cloud computing from industry experts.